Another challenge started at the TTCRD blog!! 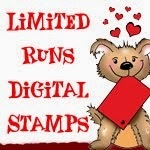 This week sponsored by Limited Runs Digital Stamps!! I had so much fun with image Art Deco FLower 2!!! Full list of deets will be available in the next TTCRD magazine! !